Find Balance and Harmony with the Chakras Blends Roll-On Kit. Each roll-on is an expertly crafted essential oil blend designed to restore balance to each of your seven chakras. Each chakra roll-on combines the therapeutic benefits of essential oils and the energetic properties of the chakra’s corresponding gemstone rollerball. Chakras are energy centers in the subtle body that are used in a variety of meditation and yoga techniques, as well as religious practices. Chakras distribute the flow of prana or energy throughout the body. There are seven chakras positioned throughout your body, starting at the base of the spine and extending to the crown of your head. Each chakra has a different purpose, corresponding to specific physical, emotional, and spiritual states of being. Use the corresponding chakra blend roll-on for the chakra you are focusing on. Follow the directions listed on each bottle for application. For more information on each chakra click the link below. Root Chakra - Apply blend to the base of spine, legs, and bottom of feet. Sacral Chakra - Apply blend to the abdomen, 2 inches under the navel. Solar Plexus Chakra - Apply blend to the upper abdomen above the navel. Heart Chakra - Apply blend to the center of the chest. Throat Chakra - Apply blend to the neck area. Third Eye Chakra - Apply blend between the brows. Crown Chakra - Apply blend on the crown of the head. WARNING: The Throat Chakra blend contains Blue Tansy. Blue Tansy has a thick, ink-like viscosity. The oil has a very strong blue color and can potentially stain clothes, porous material, and skin. This set is awesome. I love it. Full disclosure, I also had an issue with one of the screw caps being difficult to open however I contacted RMO and it was dealt with immediately. Their customer service is excellent. I recently purchased the entire chakra roll on kit, and I don’t have enough words to express how much I love these oils! The quality of RMO is amazing to begin with, I did much research into all the “top essential oil brands”, and RMO is in my opinion, the best, including the MLM oils. I started using these when Rocky Mountain was still under the name Native American oils, and the quality has only improved over time. I love these oils. I use the moisturizer and add a few extra drops of lavender oil in it and put it in before bed and sleep like a baby. The chakra roll ins have beautiful stones for the rollers, the proper stone for each chakra. These oils are amazing, as is the company and customer service. Thank you RMO! Excellent product with a great presentation. Love the mixes and the extra touch of the roller balls matching the chakras. Love how the stone is the rollerball! So far, I have only used the Heart Chakra and the calming and sense of peace are felt immediately. LOVE the smell. I am excited to try the other oil chakras! Thanks RMO!!! And great customer service too! I love these! The roller ball is a gemstone! I use them everyday~ They are my new favorite oils! If you want your chakras balanced and to feel grounded, try these, they are wonderful and you won’t be disappointed! My husband and I have both been using these blends daily and have felt more balanced overall. The blends smell lovely, and I am in love with the crystal roller balls! I love this collection and the roller stone incredible! I lOVE these Chakra blends. They smell so good and are just beautifully made with the stone rollers. My only complaint is my heart chakra roller doesn’t roll very well. But I think after some use it may loosen up. Other then that they are perfect! Thank you! I can't say enough about this chakra kit. I keep it in my bathroom and put on all seven blends after my shower. The caps tend to stick a bit but I really love the stones in each bottle, I plan on reusing these bottles. I would love to see RMO sell these blends in regular bottles so I can refill the roller bottles. Thanks RMO for another great product! These are exactly what I've been looking for! I love love love the combination of the oils with the stones. Love all the blends. Super special roll ons. My fave is the heart chakra blend. I LOVE this kit. When I apply the oils as suggested to points connected to each of the chakras, I feel sooooo good. And the gemstone roller balls is the best idea ever. Well done RMO! Love this kit. The roll on is the easiest and best way to go. I would definitely recommend this to all of my family and friends. It has everything you need to feel relaxed and ready to face the day. Wonderful roll ons/ great fragrances! They all smell wonderful and I love the convenience of the roll ins. Pretty packaging too! I would recommend these to anyone whether for the purposes they are designed for.. or just for a light fragrance. I wish they came individually. I use Root Chakra the most and I don't need a whole new set. That's my only problem with it..
Amazing group of oils and scents. My daughter just tried and will be ordering too. This is my favorite line RMO has ever put out. The stones, the blends , dilution, everything!!! The smell is just enough. For those complaining about the 90/10 I disagree. If they were stronger they would be way too overpowering!! I use these for meditation and it’s great. Some of these blends have string oils that if they weren’t dilluted this way they would distract from meditation I feel. Well done RMO ???? Love it, a great kit of roller bottles with a good reference guide. I woke up one morning totally unfocused and unsettled with a very long “to do” list and company arriving the next day. I’d received my roller blends in the mail the previous afternoon and decided to give them a try. I was amazed and delighted at the quick results. The “to do’s” were accomplished in good time, as well!I would highly recommend this product! It's a really nice set. I am loving it. Love this kit! The scents are amazing. I am so happy with the chara set. The size is great, not skimpy. Directions on where to apply are included, and that the roll on balls are made of the appropriate gemstones is a wonderful bonus! Love them. I love this set. Very expensive to import to the uk but I found I resonated with the oils relevant to my blocked chakras. Interesting. These oils are really great, as usual. I love that the roller balls are a stone that represents the chakra, enhancing the oil experience. The free bag I received ( limited offer??) was a bonus! It was bigger than I thought it would be and holds more rollers! The oil blends are amazing. I like the Chakra blends very much. I have used several I also appreciate the information on your website regarding the Chakras and what is in the each of the roll ons. Theses along with meditation have been helpful to me. I tried these the day after traveling to see my family and family can be stressful. I felt grounded, calm, in a great mood, and felt overall great the whole day. Despite a few issues with some of the lids on the bottles, the rollerstones and oils are awesome. I love them! I just received my order of these chakra oils, and they are amazing! They have such a wonderful effect of my system. I’d highly recommend them! The lids seem to be hard to remove and put back on. I have one roller that isn't working properly.I will continue to work with it and see if I can get it to loosen up a bit. Overall though the product itself is great and I love the combo of the chakra gemstones and the oil combinations. They all smell wonderful. Love the kit! 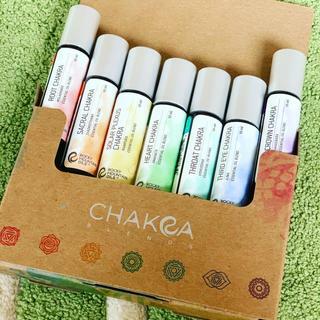 While there are other brands that offer chakra blends like this I haven’t come across one that has crystal roller balls which was a huge plus for me in choosing the kit from RMO. The only reason I gave 4 stars instead of 5 is the roller ball for my sacral chakra bottle is very sticky and does not dispense the oil as well as the other bottles. I love it so much! Thank u for the fast delivery! Very efficient!! I really like to apply them and they smell nice. The oils and natural stones for the roller balls are amazing, trying to unscrew the lids are not. To me it seems the threads on the lids are not cut right. I would give 5 stars if lids came on and off smoothly. Thank you. Blends are great... the bottles are not!! I love all of the smells but the bottles are awful! Each one can be very difficult to open and the caps do not screw on/off smoothly. They look and smell nice. The labels are nice because they explain where to apply the oil and a little about each chakra. I would give a 5 star if the roller balls were of better quality. I love that they are made of gems but there is very little oil yield because of the roller will not roll much. I purchased this set a couple weeks ago and have been using them since. The lids can fit a bit odd and you need to like the roller style. I hope they come out with these as oil for diffusing as well . Love the blends, however the roller ball crystals do not roll smoothly. A couple of them need a good amount of pressure to get them to move. In general, like these roll ons’. Also like that each one has a different crystal roller ball. However, wish the scents were bolder. And they were very hard to open. If you choose to buy these...run them under hot water to open. I like the blends but not the bottles. Caps don’t work great. Very happy with blends, having difficulty with roller bottles. 3 of caps stick and are difficult to open, do not close well. Love product and concept but frustrated with bottles. I do like using oils at a lower dilution rate - 90% carrier oil is a bit high for me and the scent is not as strong as I like. I do like the seven blends - just wish I could smell them for longer. I didn't know about the 90/10 dilution rate and probably wouldn't have bought the set if I had know in advance. Love the idea of using oils with roller balls made from crystals! Can I buy a single chakra oil blend, or is it only sold as a set? At this time, we only have the Chakra Blends available in a kit, not in singles. However, we do look forward to selling them separately in the near future! Why is the dilution rate so high (90% coconut oil and only 10% actual essential oil)? Why not offer these in full strength oil blends (100% essential oil) with the option to dilute it ourselves? Any oils that we offer in Roll-Ons are prepared for topical application. Essential oils should not be applied to the skin neat without proper dilution. I read: "10% dilution;" that would be fabulous (does it mean only 10 % filler oil and 90% essential oils)? The ingredients were not listed is the usual way, so I want to clarify... I'm interested! But, if it is the other way around, 90% coconut oil I'll pass and make my own. The Chakra Blends are prepared for topical application, they are at a safe adult dilution rate of 10% essential oil and 90% carrier oil. BEST ANSWER: Excellent question! Depending on the body, it can sometimes take up to 2 weeks before effects are noticed. However, when it comes to Chakras and energy work, it is a little different and requires consistency and practice. We would suggest checking out our blog for more information on balancing and working with your Chakras. When the Chakra Oil’s are sold separately will you send a advertisement email? BEST ANSWER: Great question! Our Chakra Blends are now being sold separately. Emails were sent to those signed up for our newsletter. What do we do with the gemstones once the oils are gone? Will there be refill bottles sold at some point in the future so we can reuse them? The Stone Roller Balls on the Chakra Blends are reusable and can be used on any Roll-On. We do carry Empty Roll-On bottles that you may use to create your own DIY Blends, so you may be able to remove the Roller Tops and place them on the empty bottles. Will there ever be refill bottles of the actual Chakra Blends to use to refill these roll-Ons? We do not have immediate plans for this. However, it is a possibility for the future. Is this a limited time kit or will it always be available? It will always be available! However, the Black Vegan Leather Clutch will be free for only a limited amount of time. Are the gemstone rollars real crystals? Each gemstone is natural cut stones, so they will reflect their natural cut and reflect the patterns of the stone. Roller Balls will all be unique depending on how the stone was cut. The 10 ml roll-on bottles as 3 1/4in by 3/4in. Do the roller tops come off so I can refill the bottle? The plastic piece on the bottle is removable which allows access to refill the bottles as much as you need. Might these blend be offered neat in the near future? We do not know details in regards to changing the blends neat for the future. However, we greatly appreciate your feedback and we will pass along this information to the appropriate party. Do you use all of them at once (daily) or rotate them? It is usually based on your own personal preference! You can rotate them or use them daily based on the routine you choose. Can or should they be used simultaneously? It is usually based on your own personal preference! You can use them simultaneously or one at a time based on the routine you choose. Any ideas about using these oils? Like would you use all of them each day, or choose one or two chakras per day, or work on one chakra for days or a week at a time,etc? A lot of the time, it is based on the person using the oils. They can be used at the same time, however, it is common to work on one chakra at a time (starting with your root chakra). We would highly suggest checking out our blog for more detailed information on using the Chakra Blends. What is the dilution percentage of the chakra blends? BEST ANSWER: Our Chakra Roll-ons are prepared for topical use at a 10% dilution of essential oil to 90% Fractionated Coconut Oil.